What's Next? : I'm a bloody genius! For all of you following my foray into 12 volt electrics, thanks for following along. 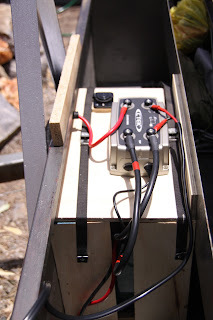 The battery has been secured, the wiring has all been done, and as I write this the battery is being charged successfully by my new solar panels. And today you get pictures! This is the CTEK dual charger, with the battery housed in the box underneath. This charger cost about the same as a smart solar charger but has a few bonus extras. The red cable that you can see on the left hand side attaches to an Anderson plug coupling which connects the trailer to the car's alternator (I haven't got the car cabled yet), allowing me to charge the battery whilst driving along. The charger itself is a five stage charger, which means that it is fast and very efficient at getting the battery charged almost up to 100%. Many chargers are unable to charge batteries fully due to the small voltage differences at near capacity, thus reducing the actual amperage available to be used. However, with this sort of charger, combined with an AMG battery, I'm able to achieve 100% capacity when fully charged. 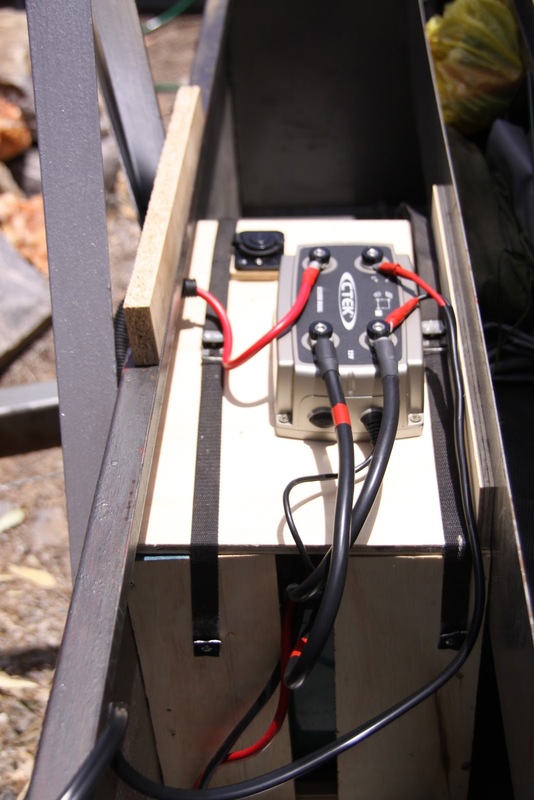 The CTEK uses MPPT when solar charging, meaning that this also is highly efficient. My only disappointment with the CTEK is that it just has a few lamps to tell you charging is happening, whereas a small digital display telling you how charged your battery is would have been nice. The cable crossing across the bottom, and you can see it again in the lower right corner, is the cable attached to the solar panels. I gained a new skill this week, as I had to join the panels together with some hinges, so I learnt how to use a hand rivet tool. Piece of cake you say! Not totally I say, because the hand tool is quite large for a small handed girl, and at one stage I managed to catch a bit of flesh in it. Ouch! Bruise now fading.. The small black square towards the top of the picture is a cigarette lighter socket, so I can run a light, or a 12 volt shower. This circuit is directly connected to the battery without a fuse. The red and black cables disappearing off the bottom of the picture are the cables which connect the battery to the fused circuit box up the back of the trailer. I still have to mount the board onto the sidewall, but this is what it looks like. At present I've only got two loads running off the circuit board, the fridge and the triple cigarette lighter sockets. As I only want to run a couple of lights, that's all I need at the moment, but I've room to add more if I want. Here's what it looks like all connected up. And right now it's happily charging up my battery. And yes, it all works brilliantly. Aren't I the genius? Now that the electrics are done, I just have to finish derusting and repainting the trailer, a job I hope to have finished by the end of next weekend. It's not that difficult to fit in an hour or so before work each morning putting a coat of paint on, but the use of noisy power tools to remove rust at 5:30 in the morning might be a bit un-neighbourly, so that's left to the weekends. But the wind is now blowing from the south, there's a bit of swell out there, so it's time to hit the beach for some windsurfing. Why go to Perth when you don't have to?